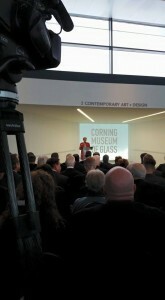 Today, the Contemporary Art + Design Wing opened to the public at The Corning Museum of Glass. It was the culmination of three years of hard work and preparation. Every part and piece, a testament to the dedication of a phenomenal staff who believed this expansion would further the Museum’s mission to tell the world about glass. Today, the world could finally see the rest of the story. 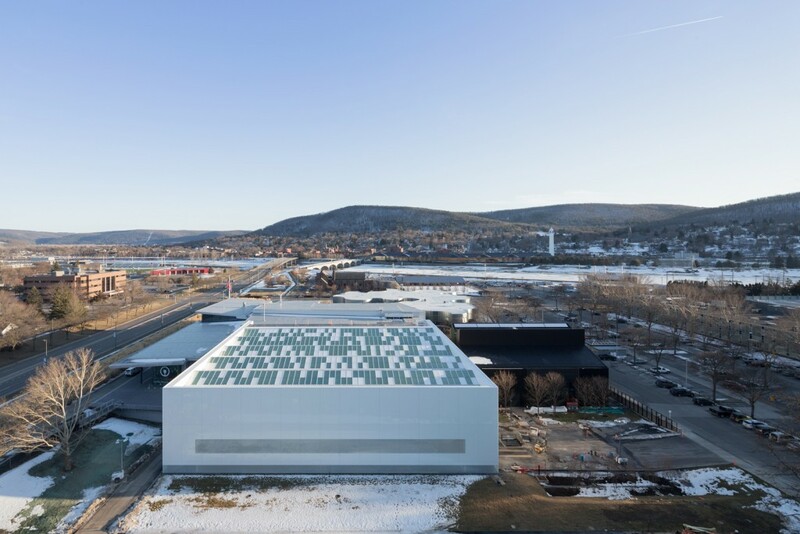 The Corning Museum of Glass campus, featuring the new Contemporary Art + Design Wing, designed by Thomas Phifer and Associates. 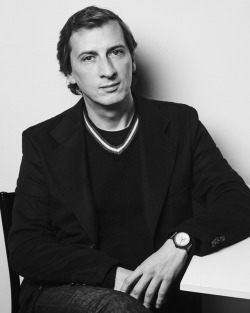 Photo by Iwan Baan. Courtesy of The Corning Museum of Glass. 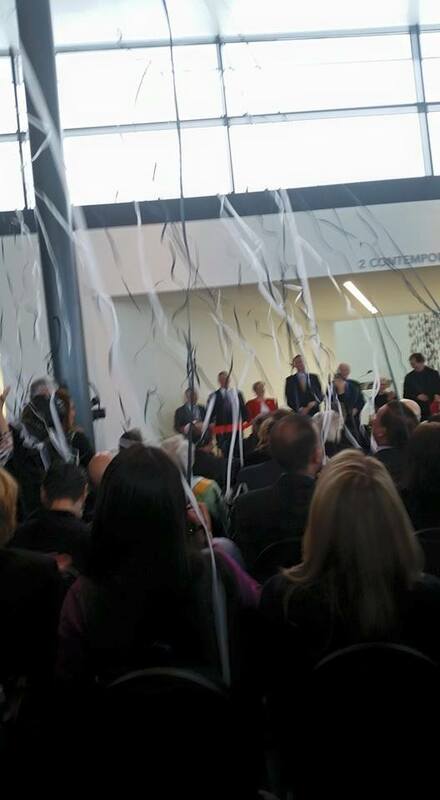 The 100,000-square-foot wing was fully funded by Corning Incorporated, and the company’s CEO, Wendell Weeks, was there to echo Karol’s sentiments and excitement about the new opportunities to share the story of glass. “I could not be more proud of Corning’s longstanding support for the Museum,” he said. “We’ve had a long love affair with glass. It inspires us with its beauty; surprises us with its versatility; challenges us with its complex physical properties; and transforms our lives with its unique technical capabilities. 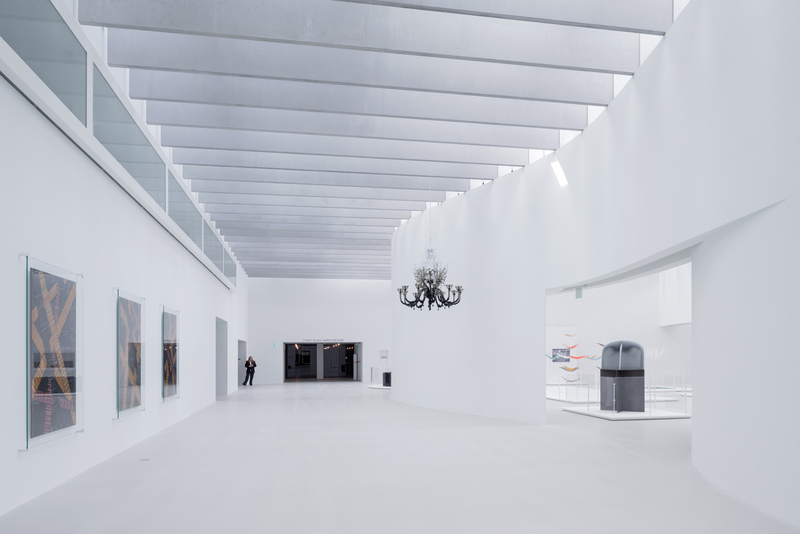 Audible gasps could be heard as the public caught a first glimpse into the new stark-white gallery space. View of the Promenade leading to the new Amphitheater Hot Shop in The Corning Museum of Glass’s new Contemporary Art + Design Wing, designed by Thomas Phifer and Partners. Photo by Iwan Baan. Courtesy of The Corning Museum of Glass. In the hour following the ribbon cutting, visitors meandered through the galleries, pointing out architectural details, and marveling at the new works on view. At noon, the first Hot Glass Demo started in the Amphitheater Hot Shop. Visitors flocked to the 500-seat space to get a taste of the endless possibilities this hot shop affords. Explore the new galleries using our new GlassApp and find activities for all ages including hands-on stations and scavenger hunts. 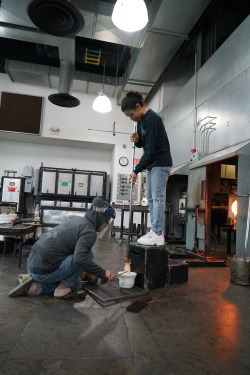 Several guest artists will demonstrate in the new Amphitheater Hot Shop. Make your own memento with opening-weekend-only Make Your Own Glass projects (fee applies). Grand Opening 2300°: Saturday, March 21 from 6-9 p.m.
Everything you love about 2300° is going to be even bigger and better. See an amazing lineup of live musical entertainment with Solidisco, Gold Dust Lounge, and Rockwood Ferry. 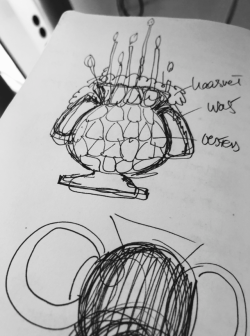 Don’t miss designers Steven and William Ladd who will present an unforgettable glassmaking and design performance in our new Amphitheater Hot Shop.